I'm well aware that hearing about other people's dreams is one of the most boring things going, and I don't think I've ever been guilty of talking about mine here. But the one I had when I was napping just now was so horrible, I just have to share it. It was after the baby was born, apparently quite a few months after. Bryan came back from an outing with him (yes, him! make as much or as little of that as you will) to tell me that the government had taken the baby away from him because a woman had reported him for feeding the baby a tater tot in a restaurant. This was apparently an offense serious enough to justify having the baby removed from our home, and the authorities would hold onto our baby for up to 30 days while they investigated the incident. My subconscious's ability to create strange legal scenarios aside, what was striking about this dream was how viscerally I reacted to having my baby taken away. I sobbed so hard in the dream that when I woke up, my chest was hurting. It took several minutes to shake off the horror, and half-an-hour later I'm still ready to cry thinking about it. They took my baby away. Even though I'm well aware it couldn't really happen like that. So now I'm wondering: is that what motherhood feels like? That deep, that vulnerable, that real? I love this little one I'm carrying quite a lot already, but I'm expecting - especially from watching my sister with my new nephew - that I'll be much more aware of that love after he's born. But if what I was feeling in the dream was like reality, I've got no idea what I'm in for. (In a good way, of course.) Moms, clue me in here. Is that what it's like? Incidentally, this is the first baby dream I've had since I got pregnant. I know lots of women dream about their in-utero kidlets all the time, but in the past five months I've never had a dream where we had a concrete baby. (Errr, a dream wherein our actual baby is a concrete reality, that is. A dream where we had a baby made of concrete - now THAT would be one weird dream!) So, um, I guess in a certain way it's good. I've been waiting for a baby dream and I finally had one! I just hope they're not all like this one. Tomorrow I will be twenty-three weeks pregnant. 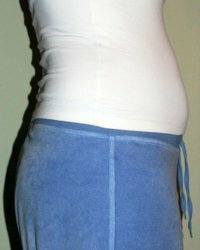 This past Saturday marked four months to go until my due date of October 24. Emily (whose blog you should be reading, because it is hilarious) is also pregnant, and due three days before me. In her latest entry, she shows off some (pretty darn cool) onesies that she decorated herself. Normally, reading a post like Emily's, I'd just think "wow, those are cool" and move on. But today it occurred to me - she has onesies! 3-6-month onesies, even! And she is due a mere three days before me! I do not have onesies! This cannot be good! 4) Three pairs tiny socks (also from my mom). Now, I've never been a parent before, but I'm guessing that this is Not Enough Stuff to enable us to care full-time for a newborn. Even if we never left the house, we'd need more stuff than that. And we do plan on leaving the house. I'm thinking we're not totally UCNP (popular family abbreviation; clean way to say "screwed"; short for "Up Creek No Paddle") yet because we do still have four months. Practically every detail of our wedding was planned in less time than that, for heaven's sake. But as I've started to research baby stuff, especially the big things like stroller/carseat/co-sleeper/crib, my head's begun to spin. There is so much variety out there! It's mind-blowing. Since I know how much fun it is to give advice on the Internet (I know this because of how excited I get when someone actually solicits advice, even if it's a topic I know nothing about), I'm asking for advice now. Bring it on! Give me everything you've got on the topic of baby stuff. Products you loved, products you hated, products you never used, products you couldn't have lived without. I want to know! And there, now I feel like I've done something toward this whole Baby Project today, and I can go have a cocktail. Or at least a cocktail onion. Last night it occurred to me to stop by my own blog, and I was horrified to find that it has been nearly two weeks since I last updated. What kind of mother am I going to make, if I can’t even take proper care of a freaking website? I will make excuses anyway, just because I can. So, let’s see… first of all, my nephew was born, which was hugely exciting, and he is a hugely exciting person. Well, as exciting as someone can be whose main activities are sleeping, eating, and pooping, in that order. (The child hardly cries at all. I am not kidding. It is beautiful and amazing and I am praying – for my sister’s sake – that he continues to be this calm, and – for my own sake – that our baby is of a similar temperament.) Sometimes he is awake and he looks around and makes these really great faces and we all marvel at what a genius he obviously is. I am very proud (although I shouldn’t be, because I had nothing to do with it) because little Daniel is like his Aunt Arwen in several ways. He has my long fingers, the same ones that made a nurse say in the hospital when I was born, “Oh, a piano player!” I’ve got a peculiar way of sneezing which I got from my mom, where I always sneeze numerous times in a row (my record is seventeen, but six or eight is the norm) and little Daniel seems to have inherited it – at two-weeks old, which is really negative-two-weeks gestationally, he has already been heard to sneeze four times in a row. And okay, that only happened once, but I’m convinced he’s got to be a marathon sneezer like me. Lastly, (and worstly for him, I’m afraid) he seems to have my predilection toward hiccups, although it could just be a baby thing which he’ll outgrow. 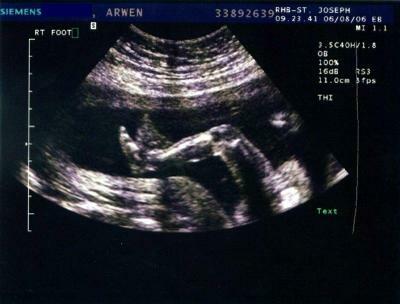 (My mom felt me hiccupping in the womb as early as thirteen weeks, well before she ever felt me kick.) At this rate, I’m thinking our baby is going to have to be exactly like my sister, just to even things out. Another excuse: my mom was here for the first week after Daniel was born. She couldn’t stay at Casa la Baby because they were still living in a tiny little apartment with no room for guests. (They’re in the process of moving into a larger one right this very minute. I would be helping but Bryan is – I kid you not – absolutely militant about my not lifting anything heavier than a grapefruit. I tease him about being bossy but actually I find it quite endearing.) So she stayed here, which was totally great, but left less time for the computer. 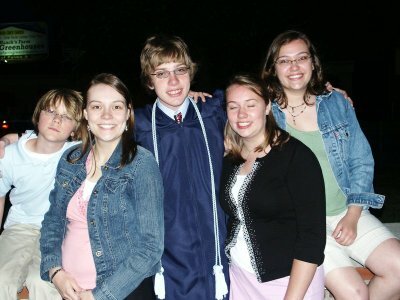 Yet another excuse: my little brother graduated high school! He’s the fourth kid in our family; only two more to go before my parents have an empty house. This fall he’ll be joining the Coast Guard. I’m sort of flabbergasted that he’s old enough to be grown up and moving out, so I can only imagine how old it makes my parents feel. Thanks to all these distractions and my deplorable habit of procrastination, when we left for our trip to DC last Friday I had only managed to set up two visits with other bloggers or blog readers. And one of them was my aunt, but it still counts because she reads my blog and that was how she found out we were coming down there. (I actually have multiple aunts who read this blog, if you can believe it. Hi, Aunts!) I felt badly about it but in the end I was glad that I hadn’t arranged any more meetings, because it turns out that a pregnant Arwen and the Metro do not, um, mix well. To put it mildly. Fortunately, the train was practically empty at the time, as it was 9:30 on a Tuesday evening and we were quite far out in Maryland. (We rode the Metro to the last stop to meet my aunt and uncle, who obligingly drove all the way from Pennsylvania just to have dinner with us.) I didn’t feel nauseated, just headachey and uncomfortable, and the actual getting-sick part took me by surprise, which was a little scary because on previous occasions I have always been able to anticipate it. I certainly don’t relish the idea of losing the ability to anticipate it, and walking around blithely with no idea whether I’ll be tossing my cookies a few seconds later. Ick. We took a taxi back to the hotel. Actually, I insisted that we try getting back on the train first, which we did, but I apparently looked so awful that Bryan made us get off two stops later and find a taxi. I was subsequently very grateful – the taxi driver had all his windows open and it was a very pleasant ride, while the half-hour more that we would have had to spend on the train would have been very unpleasant. When we disembarked from the first unfortunate train, my former Boy Scout husband courteously informed the operator of my incident – I think he had some vague idea that he could clean it up himself – but she was completely unconcerned: he quotes her waving her hand and saying, “I’m not worried about it.” This helped greatly to allay my guilt about the whole thing. But you know, I still feel sorry for the person who had to clean that floor at the end of the night. If I knew how to find him, I’d send him a card and a generous tip. I was so scared of the train after that, I almost considered canceling my other blogger-meeting. I’m really glad I didn’t, though – not only did I have a good day and manage not to get sick on the train, but I had a great time with Amalah (and Noah, of course). The delightful Amy is even more interesting (and also, I think, more grounded) than she seems on the page and her baby is even more mind-numbingly adorable. Seeing him definitely made me achey for October to get here, already. 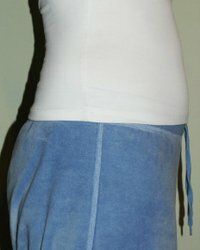 Speaking of which, we missed the 22-week belly picture, so we’ll take a 23-week one on Tuesday. Bryan and I are going to see Cars now. We’re so grown up, it kills me. This seems kind of mundane compared to what's going on with other people in my family, but a couple of you have asked about how the ultrasound went this morning, and far be it from me to deprive you of such information as I possess myself. Which is, um, really not much. The appointment was at 9:00, which is rough when you're used to crawling out of bed around 10:00, but it was for a good cause so I didn't mind. 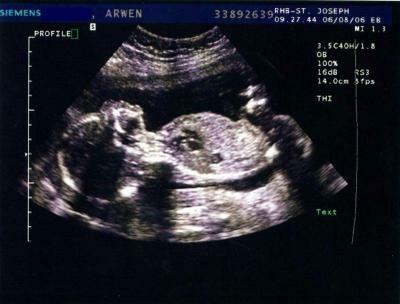 Unfortunately the ultrasound tech was kind of grumpy; when I went with my sister to her twenty-week scan (at the same place) back in February, the tech was very friendly, so I'd naively assumed ours would be as well. But this woman was silent and seemed unimpressed by the fact that she was getting the chance for a sneak peek at the most adorable child in existence. The people at the radiology place are not allowed to give results (it says so in large letters on the wall) so we won't find out for certain whether everything is all right until my next OB appointment, in a week. But my doctor told us how the radiology people would act if something were wrong (calling reinforcements, taking extra pictures, looking worried, etc.) and nothing of the sort went on, so I'm assuming we're okay. I was only sort of kidding about the most-adorable-child thing. I know I'm biased, but this is a pretty cute one, right? I'm excited to be finally half-done with this pregnancy. In another twenty weeks, we'll get to meet this little one! Still loving the velour pants, although it's getting a little warm for them. I can tell I'm going to absolutely love being pregnant in the dead heat of summer. I'm going to see my new little nephew in just half an hour! We just got back from my twenty-week scan to find out that my sister is at the hospital in labor right now. It's a little early - her due date is July 9th and she'll be thirty-six weeks this coming weekend. Her water broke around 2:00 this morning, though, so the baby is coming today. Please keep her and her husband and my little niece or nephew in your prayers! I'll update when I've got more news. Update: My nephew was born early this afternoon! 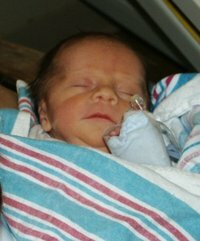 5 lbs, 10 oz, 19 inches long - pretty good for being four weeks early! Apparently everything went smoothly; there were no complications with the labor and both mom and baby are doing well. We're hoping to have a chance to visit them this evening, and I'll post a picture if I get a chance. Update #2: Aaaaaand I'm a ditz, because I forgot to post a fairly vital bit of information before. The baby's name is Daniel James. I cry a lot. I come by it honestly; my mom is a crier and so was my grandmother, apparently. When I was young I used to get annoyed by the fact that Mom cried at "dorky" stuff - articles in Reader's Digest, for example. She warned me that she used to get annoyed with her mom for the same thing. The message being, what goes around, comes around, baby, and if you think you're going to dodge the family legacy of overactive tear ducts, you've got another think coming. I outgrew the pre-adolescent nuttiness just in time for the adolescent angst. Mine was compounded by the fact that even though I went to a high school with 1800 other kids, many of whom were completely wonderful people (my future husband was among them) I chose as a close friend a total nutcase who was also emotionally abusive. (Obviously I didn't realize that at the time.) He was so crazy that I can almost guarantee you couldn't think of a derogatory name he didn't call me unless you are very creative or have a very depraved background. I shudder now to think of what I considered reasonable behavior on his part, of the way I let him talk to me and the things I let him blame me for. After a year and a half of the craziness I finally pulled it together to tell him we couldn't be friends anymore, but by that time I'd cried years worth of tears in just a few months, and firmly established the crying habit. There was really no going back from there. Less than a year later I started my first real romantic relationship, which also happened to be my last. Bryan, as we all know, is a wonderful person, but that did not mean our relationship was conflict-free. When we had our first argument I discovered an unfortunate side-effect of being a crier: I was completely unable to make it through an argument without turning on the waterworks. I'd make an attempt to tell him why I was upset (unfortunately, this was often something horribly cliche like "It wasn't what you said, it was the way you said it!") and my chin would immediately start trembling. The poor guy couldn't look at me cross-eyed without bringing on the tears. To this day I am, quite honestly, flabbergasted that he decided to marry me, to take on this messy, sniffly bundle of hormones for life. Brave, brave man. And oh, guess what else? Somewhere in there, my mother's grim prophecy came true. I became the kind of person who tears up at television commercials, magazine articles, human-interest stories in newspapers. Not too many years from now I will mortify my children by doing this, and I can't even feel bad about it. It's the family legacy, after all. 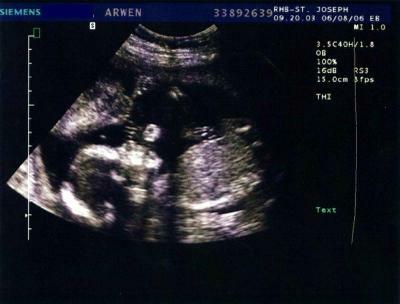 Okay, so I'm a very emotional person under any circumstances, and now I'm pregnant. 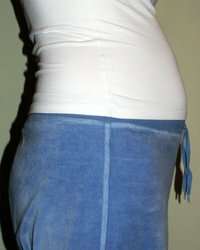 It's well-known that pregnancy makes women extra hormonal. It's the stuff of sitcoms, but it's also discussed in numerous pregnancy books. And before I got pregnant I used to read the descriptions in those books and think, "What's the big deal? I'm like that now!" So long ago I expected the distinct possibility that pregnancy, once achieved, would turn the normally volatile me into a raging mess. Then came infertility, which turned me into a raging mess even though my hormones were the same as they'd always been. It was really, really hard, and I cried all the time because of it. 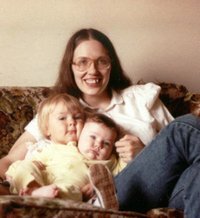 So when I made the amazing discovery that I was pregnant, even though my hormones did start raging out of control, I was so happy that I wasn't likely to start crying for no reason. In fact, during this pregnancy I've gone days at a time without crying, which for me is quite an accomplishment - there has never been a time in my teenage/adult life when I could claim that. Very strange, but very true: pregnancy had actually turned me, crazy crier girl, into a fairly reasonable person. We got kind of used to it. So then yesterday morning Bryan called me from work with a possible change of plans for our upcoming trip to DC. It was not a big deal, and no decisions had been made; that's why he was calling for my opinion. My opinion was that I didn't want to change the plan, for a number of reasons, reasons which in my pre-pregnancy days I would have been able to articulate with ease. Yesterday, though, I couldn't, because I suddenly discovered that I was bawling. For, um, no apparent reason. And to the extreme chagrin of my husband, who I know felt really bad about it, even though I kept telling him that it wasn't his fault. Also to the chagrin of myself, because I'd been enjoying being a member of The Sane and Reasonable Who Do Not Cry at the Drop of a Hat, and was bummed to be rejoining the nutty. On the other hand, it's good to be back. Although I haven't lost it again since yesterday, I know it's only a matter of time, and it's better to be okay with that than to frantically try to avoid it. Besides which, there's the question of exactly how statistically anomalous I really want to be. I've already got a pretty "Twenty-three years old, took her two-and-a-half years to get pregnant" badge; do I really want a "Made it through nine months of pregnancy without a single hormonal freak-out" badge to go with it? Naaaaah. Better to be normal, I guess. So, let's see here. Item number one: am most certainly a bad, bad, nearly abusive blogger, since I promised belly photos a week ago and am just now getting around to posting them. Feeling kind of ridiculous doing this, since I am currently 19w3d and therefore much closer to twenty weeks than to eighteen, but I can't just skip posting the eighteen-week photos. It would be unscientific. However, this one's not going to be a shocker. 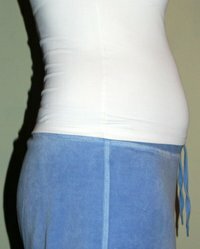 The eighteen-week photos are pretty much identical to the sixteen-week ones. In fact, see if you can guess which is which below (without going back to the sixteen-week post and checking, obviously). Okay, that's enough time for guessing. Eighteen-week photo on the left; sixteen-week photo on the right. Give yourself a nice little pat on the back if you got it right. For your amusement (or maybe because I fiiiiiinally went shopping for maternity clothes today, and am so freaking proud to be out of my pajamas that I lamely and vainly felt a strong need to take pictures of myself in real clothes) I snapped a couple shots in the mirror this afternoon. 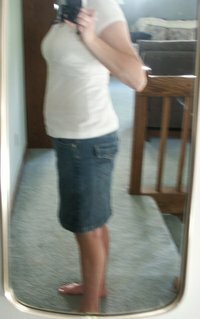 That's an (admittedly very blurry) full-body shot, so you can get the idea of what I look like walking down the street. Although I do wear shoes when I walk down the street. So, I dunno. What do y'all think? 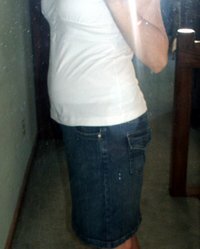 Do I actually look pregnant, or just a little tubby? I really need to know. In other news, last night I went over to Jen's for a while. Before I got pregnant I was babysitting her delightful daughter Li a couple afternoons a week (in fact, that's me in this picture), and was really bummed when I had to give it up. In a hugely happy coincidence Jen and I got pregnant at almost the same time; our due dates are just about a month apart. And it's not like we ever lacked things to talk about, but now we have even more - in the three-and-a-half hours I was there, I swear there was hardly a moment of silence. Hanging out was much fun, and so was seeing Li, who has grown up unbelievably in the month or two since I last saw her, and is now talking up a storm. I love that girl. I'm thinking I need to go hang out with my husband, who just returned a few hours ago from a two-night business trip to DC. I don't even know how many times he's been to DC since the beginning of May - I'm thinking four but it might only be three. Fortunately it's usually only for one night, and I am remarkably good at spending time alone without going crazy. (You'd think I'd blog more. I really should.) And, since getting pregnant and huge, I actually sleep better when I have the bed to myself. But of course I miss him when he's gone, and would much rather have him here. Speaking of DC, Bryan has got to take a longer trip there later in the month, and I'm going with him. I'll be kicking around with lots of free time on the 19th, 20th, and 21st (M-Tu-W). Anyone in the area want to get together? I am harmless, I promise. I won't have a car, so any meeting place would have to be reasonably close to the Metro, but if I can take the Metro, I'm there! Email me if you're interested.